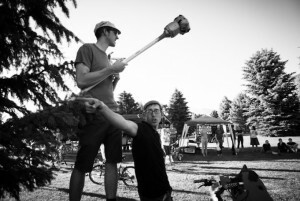 Help Orem Become Better For Bikes. Over the last year or so Orem has been working on getting a Bicycle and Pedestrian plan passed with the city as well as an extensive network of trails and lanes for pedestrians and bicycles. 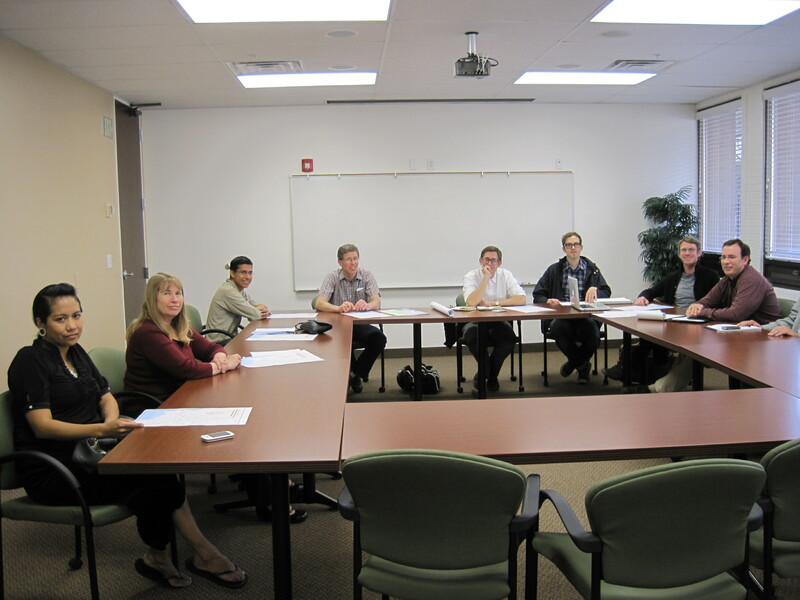 I have personally been to many of the meetings held by Orem and have been impressed with their vision and commitment. We just received an email from Brad Woods one of the main people who has been influencing this movement for many years now. In the email it had a link to the project website. It turns out that Orem is getting ready to vote on the Bicycle and Pedestrian plan and needs public feedback. If you have time get on there and make comments to help Orem in their goal to better accommodate all users of the road. Here is the link and here is an excerpt from the study. In January we had a Public Charrette where over 100 citizens provided survey information about where they walk and bike now – and where they would like to walk and bike if there were additional bike and pedestrian improvements. This was followed up with a web survey where we gathered information from approximately 800 people. We have used this extensive public input – and information gleaned from successful walk/bike communities – to develop a Draft Master Plan. Now we are seeking feedback on the Draft Plan. Please take time to review the information and provide feedback and comments so that we can finalize the Master Plan over the next few months. The more involvement and participation that we have will help us in developing the best Master Plan possible. Looking good Orem. I hope this is a wake up call to Provo to see that this is the way that happy/healthy communities are headed. We will keep you all updated on what Orem will be doing and how the plan is going to take place. Thanks Brad for the tip. 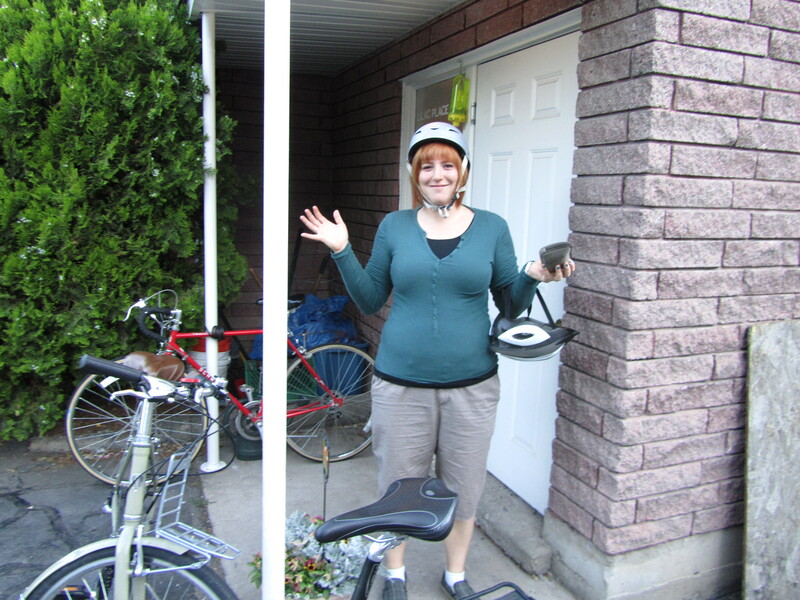 Recently I have been talking with quite a few families and telling them the wonders of biking. Many of them are surprised when they find out a) that I am married, b) that I have a little one, and c) that we do most of our errands by bicycle. Many families see it as an almost impossible task to go for a recreational bicycle ride with the family let alone to run some errands with the bicycle. I can see why this occurs. 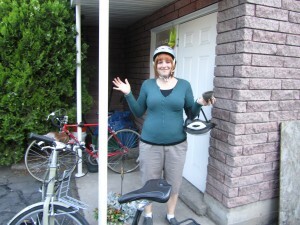 Many of us are too accustomed to conventional bicycles. For a family with multiple little ones it is really hard to have one in the trailer one in a child seat and one veering in and out of the bike lane on their own bike. I believe what many people are lacking is a knowledge of the mighty cargo bike. 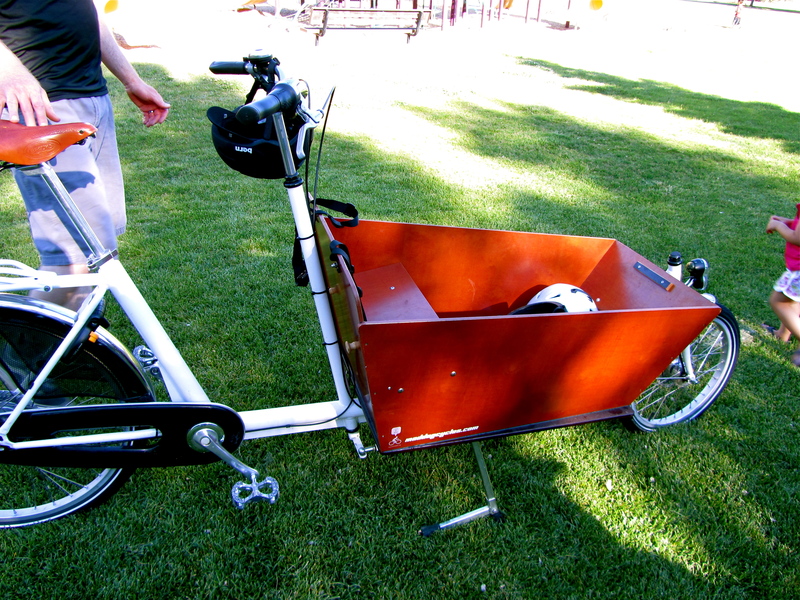 Cargo bikes are bicycles that can carry way more than conventional bicycles. 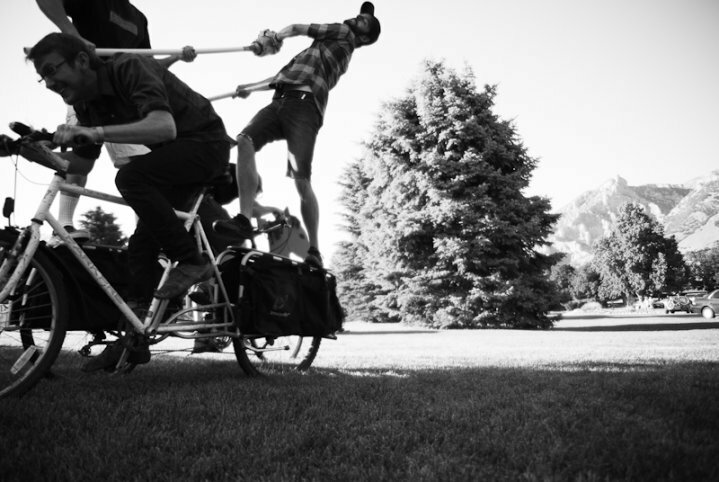 They include Xtracycles, Yuba Mundos, Bakfiets, and even Utah’s own Madsen Cycles. 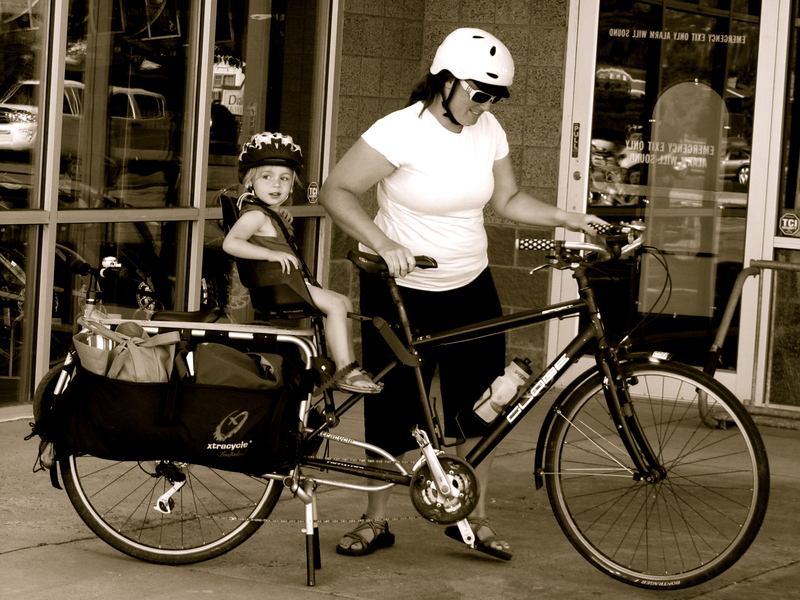 All of these bicycles make kid hauling and cargo hauling a blast. Personally we have the Xtracycle and love it. We us it for groceries, picnics, and dates. Our good friends Brad and Jenny have a Bakfiets that they use for their two kids and Costco trips at the same time. I also know people with Madsens and Yubas who swear by them. 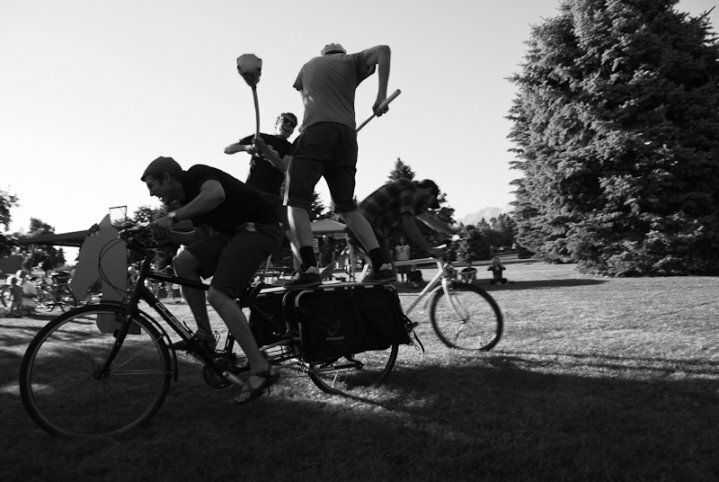 Cargo bikes actually have a little bit of a cult following. The owners of each different variety will post pictures of what they were able to haul and how far they hauled it. If you start googling these names and going to websites you will find a wide collection of trips and stuff carried. Everything from groceries and kids to refrigerators and toilets. It really is quite fun. Which brings me to the point of this whole post. There was a great article written about all the different options out there and how they can be put to work. You can find it here. None of this is to say that you can not go by bike unless you have a cargo option. I am getting to know a family right now that has 4 boys ages ranging from 8 months to about 8 years old that ride their bikes a ton and they do not have a cargo bike. They have a great system of tag-a-longs and a trailer. What I am saying is that cargo bikes make trips to the store or out to dinner an easy and less stressful event than trying to wrangle the kids while balancing bags on your handlebars. While all of us are trying to make differences in our community or at least be more connected to it we (the families) do not need to feel left out of the loop and trapped in our cars all the time. There are options and they can be a great way to help make our neighborhoods safer and our local economies stronger. So, do your homework find a system that works for you and leave the car at home every once in awhile. 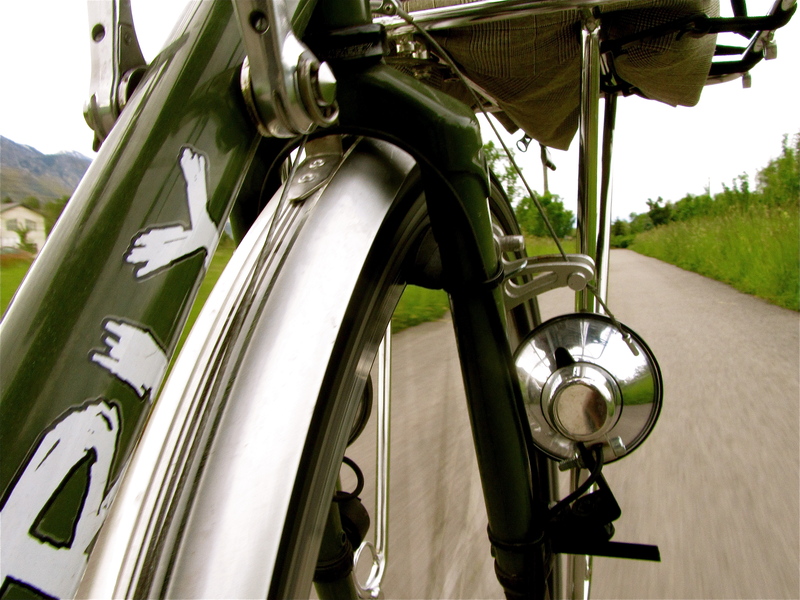 You may be surprised to find how great things can be from the saddle of your bicycle. Provelo was Bikealicious! Don't Miss the Next One! 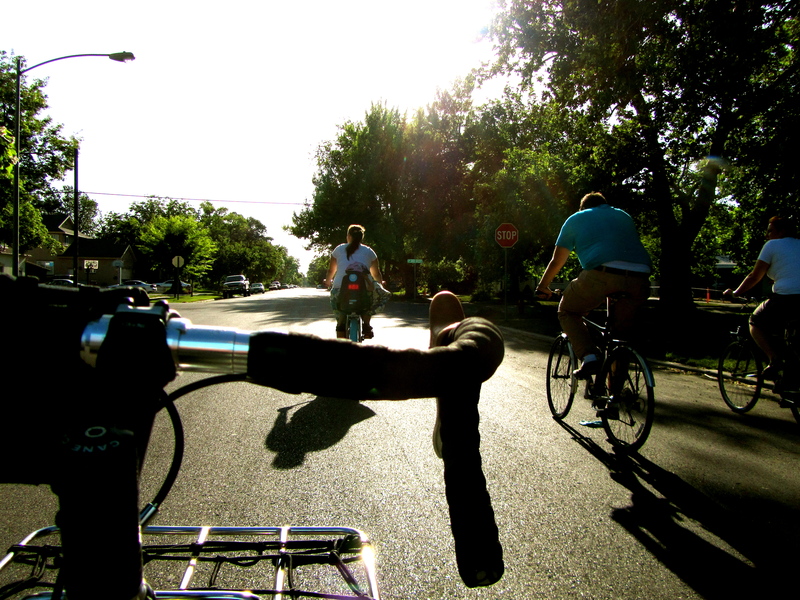 The first-ever Provelo bicycle pinic was a huge success! 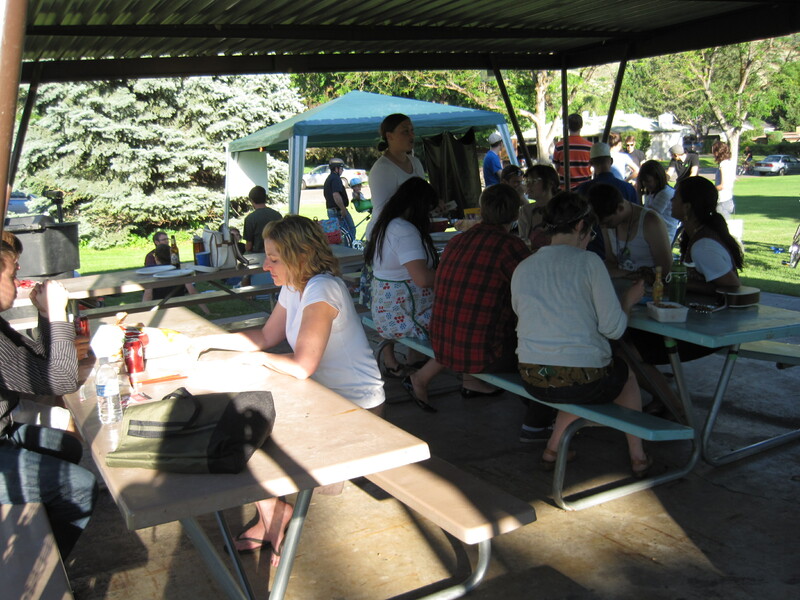 Just over 40 people showed up on bikes to meet new friends and take advantage of the weather. We were particularly delighted to have quite a few newcomers join us after seeing signs posted on trails and at bike shops around town. New friends sat together in the shade and under an umbrella to enjoy their picnic lunches and listened to some fantastic ukulele playing. There was quite a bit of snack sharing going on (aren’t bicyclists such generous people?). 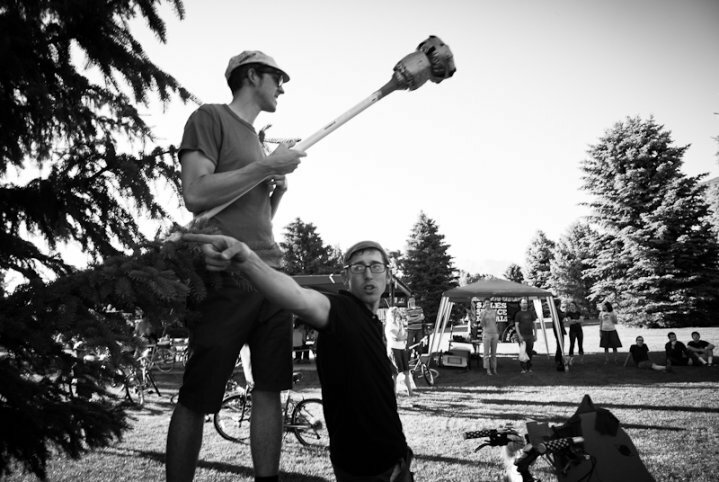 Finally, everyone gathered together to enjoy the event you’ve all been dying to hear about…bike jousting! A huge thanks to everyone that worked to make the first Provelo a hit, especially Mad Dog Cycles, the Provo Bicycle Committte, the Whitmore family, and all of the friendly people that decided to take a chance by showing up. Thanks for coming – we hope you had as much fun as we did! 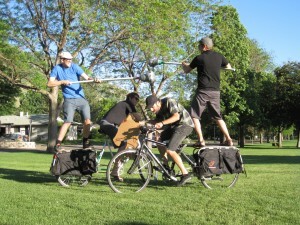 This past week has been an awesome one for bicycles in Provo. 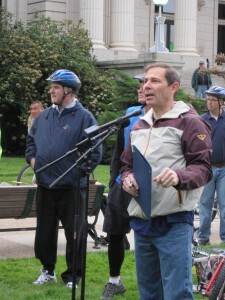 The first Provelo event took place and had a great turn out and Mayor Curtis is now riding his bike to work. With all the great stuff going on I have had a chance to do a lot of riding outside of my standard commute. For me this week also marked two good friends birthdays accompanied by two good birthday bike rides. Both rides were great and actually tie in awesomeness. However I have been told that one of our readers will be doing the first B-day ride so, I will cover the second. Happy Provelo Day! 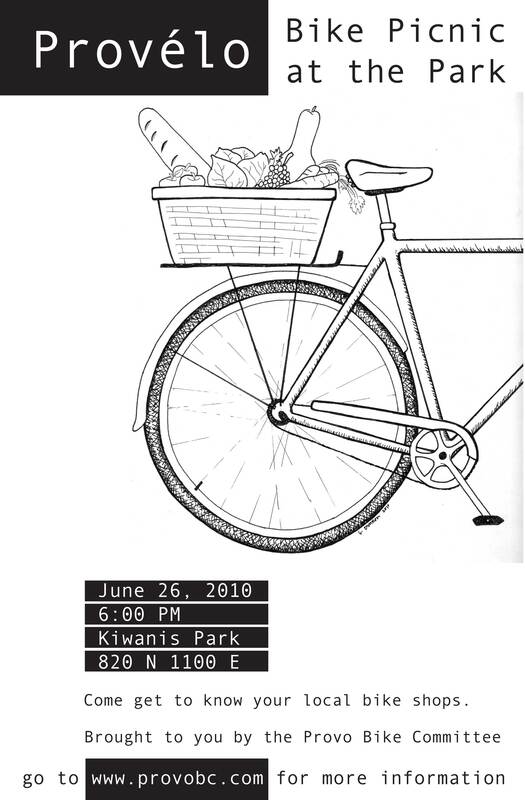 Bike Picnic Tonight! 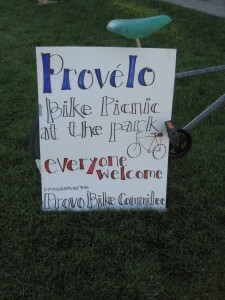 Don’t forget to pedal to the Provelo bicycle picnic tonight! When: Saturday, June 26th. 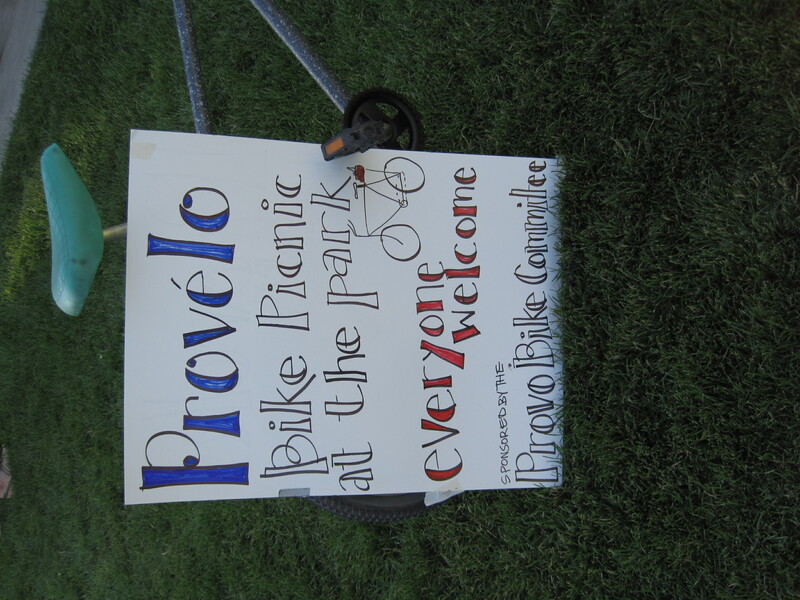 6:00 p.m.
Provelo bike picnics, put on by the Provo Bicycle Committee, are a chance for everyone to get together and enjoy a good time with some truly outstanding company. – Pedal-powered smoothies benefiting the Bicycle Committee (yes, ice can be crushed with a bike). – The opportunity to make some lasting friendships with like-minded cyclists. This is a community event for everyone, whether you’re a racer, a town rider, a student, a family, or a group of miniature elephants that ride around on a tandem. Please come! And don’t forget to invite your friends and neighbors. More information is available on the Facebook event page. When: Thursday, June 24th at 5:00 p.m.
Where: Provo City Center, 351 W. Center St. We meet in the Municipal Council Room on the 2nd floor. Join us for the Provo Bike Committee meeting on Thursday and help us plan some really amazing events for the summer! There are a lot of exciting things happening right now and this is your chance to get involved. 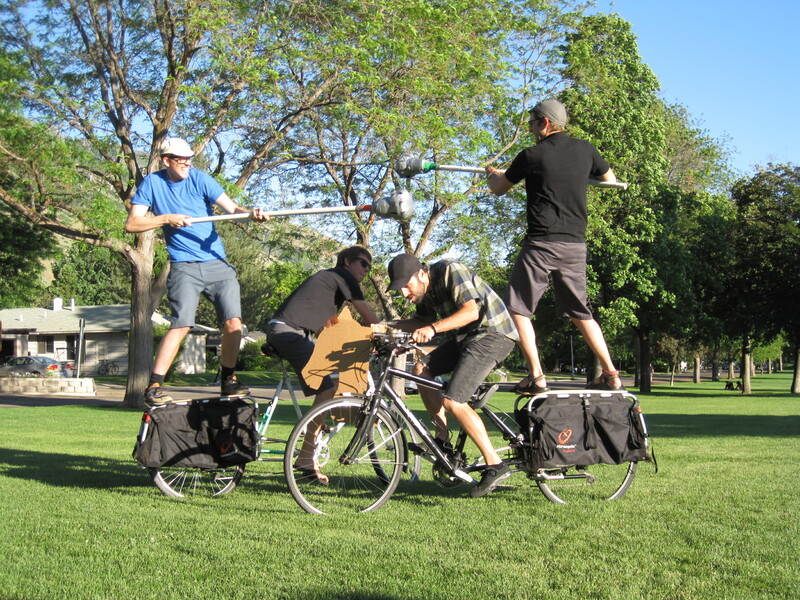 Which Provo celebrity will be riding his bike all summer and detailing the adventures for the public? 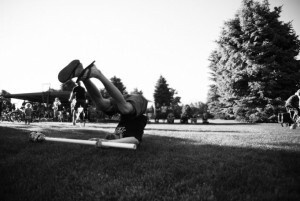 What are the juicy details of Provelo – the new summer series of must-attend bike picnics? What new bike lanes / paths is the city working on? What, exactly, is bike jousting? If you’ve never attended, this meeting is the perfect opportunity. It’s a friendly group and a great way to meet some like-minded people while sharing your opinion. We just recently received a link to a great article from World Watch Institute (thanks Jan). The article goes into pretty good detail on the benefits cycling has on a community and on a city. 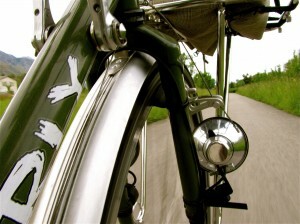 The article is titled Power to the Pedals and was written by Gary Gardner. Mr. Gardner takes a very holistic approach to cycling in urban centers such as our Historic Downtown. For the community, cycling means an improved urban ambiance thanks to decreased congestion and pollution, better quality of life because of proximity to bike paths and increased open space, and sounder fiscal health via increased economic activity and reduced taxes. If you haven’t noticed we here at BikeProvo we really love two things: riding bikes, and riding bikes in Provo. 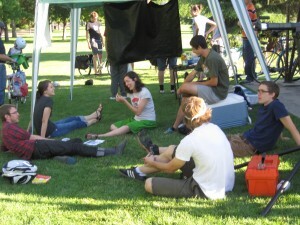 Often we get to report on events going on here in the valley as well as share our insights into bicycling in general. Basically, you all get to hear a lot from us and we don’t get to hear that much from you or your bike riding here in Provo. In an attempt to remedy that we are introducing the Monday Ride Report. The idea is a few of us will report on some aspect of our rides, commutes, or bicycle adventures and then open the floor to all of you (in the comments section) to share your experiences on the road or trail. You can write about a funny experience, or how you discovered a new road, or about how sometimes drivers really just do not pay attention. Anything ride-related. If these guidelines are not helpful with what to write make a comment so we can help you get your experience out there. Jamie and I will go first to get things rolling. I do not know if many of you know but the Mayor of our great little city has a blog. On the blog he talks about changes happening or coming to Provo as well as some of the stuff he does as Mayor. His most recent post is one that we should all read and take action with. About a week or so ago the Mayor had a bicycle stolen. It was the usual story of bicycle being left out exposed with out a lock. Luckily for him he took the time to register said bike at the Provo Bike to Work Day. As a result the Orem PD found the bike abandoned at a park and were able to return it to the rightful owners. This seems to be a running theme here in the Provo area. I lived in Las Vegas for 18 years. I lost many bicycles and saw many friends lose bicycles to theft. Not once did any of these bicycles get returned registered or unregistered. Since living in Provo I have seen quite a few bicycles stolen as well. The difference between Vegas and Provo (besides the obvious) is that all the bikes in Provo that have been registered and stolen, that I am aware of, have been returned. 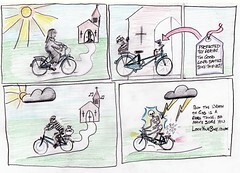 There are really good odds that if your bicycle is stolen and registered you will see it again. Moral of the story register your bike and give your self one more tool for not loosing it forever. Sub-moral of the story lock up your bike the right way.